The zucchinis are maturing in abundance, here!! How about at your place? Have you been bestowed with neighbors' zucchini? Are your plants producing zucchini faster than your family is willing to consume? This week, we've had zucchini bread, zucchini muffins, zucchini in tomato sauce, sauteed zucchini (with a variety of different seasonings, to change things up), fried zucchini slices, zucchini sticks and dip, raw zucchini in salads, and zucchini-spice pancakes. Our early apple tree was completely ready for picking this past week. This one produces red, fresh-eating apples. But that doesn't stop us from cooking them. We've had apple-rhubarb cobbler, apple-cinnamon oatmeal, apples sauteed in brown sugar, butter and cinnamon, chopped apples topping cinnamon-sunflower seed granola, as well as crisp, fresh apple slices. 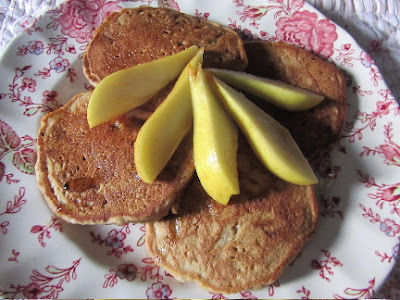 They are not good keeping apples, so we're eating what we can, this month. Many years, I chop and freeze some of these apples, for winter baking. 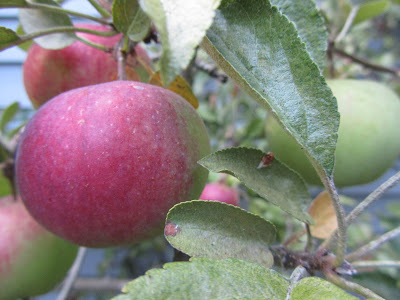 This year, the apple crop is sparse, so these will all be eaten by early September. And it's also time for the pear harvest. We have 4 pear trees, 2 of which are bearing, 1 early and 1 late. The early pears, the Morettini, set large crops for dwarf trees. 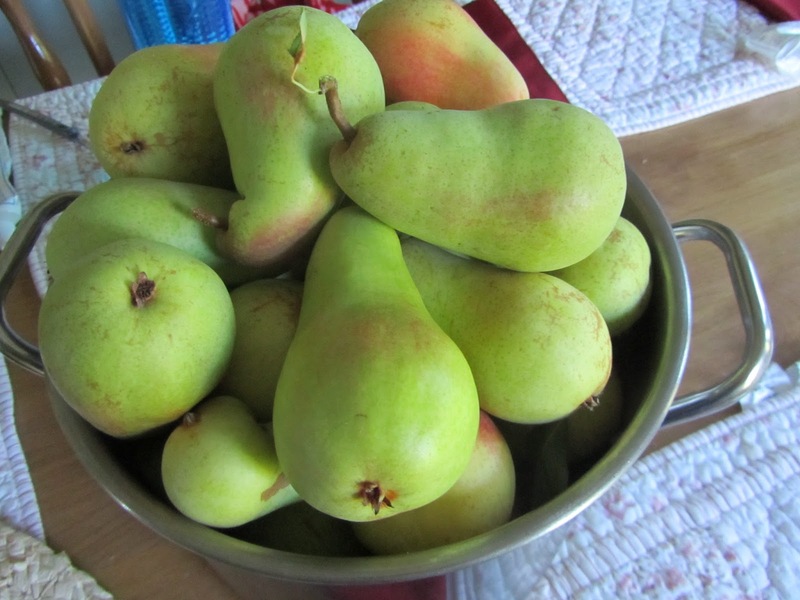 These are the yellow-green pears with a red blush that I showed a large bowl full on my blog early last September. They come off the tree looking perfect, as you'd find them at a farmer's market. 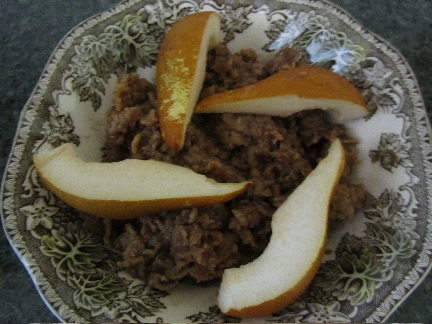 But they're not good keepers, so we've been eating pears fresh, as slices, as chunks in fruit and lettuce salads (with a creamy dressing and chopped nuts), and as a topping for gingerbread oatmeal (recipe here). It sure feels like late summer around here. What are the flavors of the week at your place? It all sounds great! Our growing season is a little different, but a lot of people are on their second planting now. I would guess that you have an extended fall growing season, in your area. We have a short fall growing season. I planted greens these past couple of weeks. But we'll get a heavy frost sometime in late October to early November, and that's it for the garden. My garden is a really odd shape, with most of it too public to turn over to vegetables. Although your garden does sound like a full time job in itself! May I ask - is your granola recipe on your blog somewhere? My eldest daughter is also off to University (College) this Autumn and I will be following your experiences with interest. I have 2 recipes for granola here. The first one is a basic recipe, fairly low in sugar. I add nuts and dried fruits, when we have some. Otherwise, I often just make a batch of this granola, as is. This 2nd one, though, has to be my favorite. I make it all fall. It has pumpkin and pecans in it. Yum! Will your daughter be living away from home for university? My twins will still live at home, and commute. But it does feel so strange for me. My babies are adults. I look at them and I think, "how could they possibly be old enough to begin university studies?" Thanks, I will be trying both of these and sending them to university with my daughter. She will be away from home - and has been looking forward to that since age 10! She has a high level of comfort at home so I'm not sure how she will manage, though she doesn't mind mess or noise, so probably she will be fine. I have asked her to come home Friday - Monday, at least until Christmas. But that's more for my benefit than hers. I am not looking forward to it at all, and absolutely - HOW did she get old enough for this? 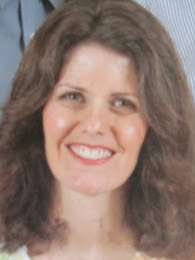 Hi Marion, just want to say, may all go well with your daughter going away. I think this is one the hardest times for me, realizing that all my children are now grown. I know that it means exciting times for them, and I try to remind myself of that. Good luck to you, "Mom"! Perhaps this means exciting times for us as well, as we see our roles begin to change, and new opportunities on the horizon. I hope you and she like the granola. The pumpkin one is really my favorite! Apples and pears, but no zucchini. However, I have three new plants in the garden and there are buds, so hopefully it will be cool enough to get some flowers! (And some of them might be female flowers!) With the heat we have a lack of bees, so I'll hand-pollinate any that we get. I did get a cucumber yesterday! (One that I hand-pollinated). Hurray! What a clever woman you are -- hand pollinating your cucumbers! I should try that with my pumpkins early in the season, when, here, it is too cool for the bees to be out. That would give us pumpkins sooner in the fall. Do you use a paint brush for pollinating? September is the month for my garden to have cucumbers big enough to harvest. I have 1, so far. I am hoping for many more. Steve got peaches from the farm market last week. :) I'm jealous of your pear tree--I love pears!! Enjoy your bounty! Do you freeze homemade applesauce? I like zucchini with orange and lemon, as well. I have a recipe for zucchini muffins that uses a combination of orange juice, and orange and lemon zest. Your lemon zucchini bread with blueberries sounds delicious. Yum! Peaches! that's something I wish we could grow in our yard. I freeze a little applesauce (about 8 pints, I think), when I have a huge harvest of apples. I am thinking of making applesauce with my crabapples this year, as I still have jelly left over from last year (jelly is what I usually do with crabapples). Do the pears freeze or can well? pears don't freeze well. When thawed they just become mush. They are okay, used frozen in smoothies. And as the pears begin to ripen quickly, I'll typically chop and freeze a few, just for smoothies. I like to leave the skin on the pears, as the majority of the pear's anti-oxidants are in the skin. They do can very well, however. many people home-can pears. I don't, mostly because we can eat these early pears in about a month, and I keep them in the fridge until we're wanting to hasten ripening, for the length of their keeping time. I also have a late ripening pear tree. It will be ready for picking in October. Those pears are long-keepers. I usually still have some in the fridge in late January/early February. I think we enjoy them fresh more than we would canned. Someday, when our other two trees are bearing, and I'm up to my ears in pears, I'll try dehydrating pears, making pear butter, and canning a few quarts. Have you ever made chocolate zucchini cake? It has a texture like carrot cake but is even more delicious. I've made a chocolate zucchini-almond bread, which was really more like cake. Quite good. I've been just making zucchini spice bread and muffins so far. Maybe I'll try the chocolate version soon. If you have sun and warmth, zucchini will grow well, and abundantly. You might also enjoy yellow crook neck squash. It's a summer squash, but has a "meatier" texture. And it's easy to grow, as well. Zucchini can also be used like cucumbers in the making of pickles and relish. If you have bigger ones just cut and scoop out the seedy part before continuing with he recipe. I have a great recipe for zucchini bred and butter pickles. It comes from a close friend, who happens to be my source for great recipes! I make dill and sweet relish with those tiny green tomatoes, that are the size of marbles, and most likely won't ripen. But I know that zucchini relish is also quite popular. Cucumbers are difficult to grow in my garden, so I've had to rely on the zucchini and green tomatoes for pickles/relish. I have also frozen alot of shredded zucchini and used it to add moisture and nutrition throughout the year to meatloafs, meatballs, baked goods, etc. I do that too! I like grated zucchini mixed in with ground turkey, as the turkey tends to be quite dry. When I thaw the frozen grated zucchini, I pour off the liquid, as use a "milk" in muffins, biscuits and pancakes. 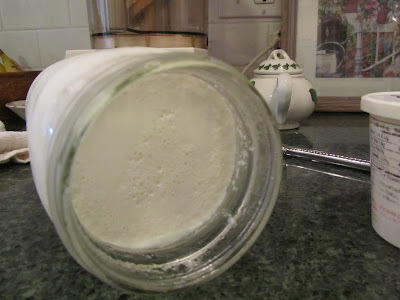 It has barely any flavor, and is a good stand-in for rice or soy milk in my dairy-free baking. So far, we are keeping up with the zucchini, thanks in part to a hungry friend of my son's, who practically drooled all over himself, eyeing our zucchini patch. But next week or the following, I imagine I'll start in on freezing some of the larger, as well as making pickles from the smaller zucchini. We're harvesting tomatoes, eggplants, green beans, zucchini, squash (or at least I think they're called that, they're big, sweet tasting zucchini, really ;)), corn, melons and watermelons, and peppers (green and red). We were blessed with abundance this year and I'm freezing things like a crazy woman. That all sounds wonderful! You will have a freezer full of summer goodness to last all winter long, no doubt!